Fast and effective way to help eliminate your cat´s ear infection issues. All Natural—No harmful chemicals, hormones, enzymes or antibiotics. Not harmful to your cat or the environment. Eliminates problems associated with a wide spectrum of common cat ear infections. Cat Ear Infections, regardless of the cause, can be serious if not tended to in a timely manner. EcoEars® for Cats was created specially for cats whose parents prefer a natural solution to overused antibiotics and chemical solvents. EcoEars contains all natural ingredients, including Organic Mullein Leaf Extract and Organic Calendula Flower (Marigold) Leaf Extract. Cats are commonly affected by ear mites and other parasites, and the subsequent fungal, bacterial, and yeast infections and irritation can cause a host of symptoms, including itchy ears, shaking of the head, bad ear smell, and gunky discharge. Give your cat relief today and enjoy peace of mind by treating his ears with natural, high-quality, non-harmful ingredients. EcoEars® for Cats was formulated to naturally and safely clean your cat’s ears and eliminate the symptoms caused by ear mites and other parasites. NOTE: EcoEars for Cats should only be used on pets 12 weeks and older - we do not recommend this product for kitties younger than 12 weeks. As with all of our products, we offer a 100% no-risk guarantee. Just try a product as directed and if you’re not happy for any reason, we’ll refund your money. You can trust EcoEars to naturally and safely clean your cat’s ears and eliminate the symptoms caused by ear mites and other parasites. Your cat’s itching and head-shaking from ear infections can be resolved in as little as 2-3 days (we recommend longer use to clear up all infection symptoms). Use as directed. Pour EcoEars on a large cotton pad. Recline cat on its side. With your forearm resting on cat’s body, cradle cat’s head with that hand. With your other hand, gently wipe away visible debris from the affected ear with a facial tissue and apply EcoEars by squeezing with saturated cotton pad into the ear. Restrain cat momentarily from shaking its head. Gently massage the base of your cat’s ear for 90 seconds to ensure EcoEars saturates the ear canal. Remove cotton pad and dry outer ear with facial tissues or a soft cotton cloth to remove debris. Allow cat to shake. Offer cat’s preferred food as a reward and treat cat’s other ear if necessary. Repeat twice per day for 10 consecutive days. For severe cases, EcoEars may be safely continued for an extended period. If condition persists or worsens, please consult your veterinarian. NOTE: Do not use with other ear products or when blood is present. Instead, consult your veterinarian. Denatured Grain Alcohol, Organic Calendula Flower (Marigold) Extract, Witch Hazel Extract, Organic Mullein Leaf Extract, Ionic Silver, Rosemary Extract, Allantoin, Boric Acid, Vegetable Glycerin, Polysorbate 20 (food grade). I wouldn’t think denatured alcohol would be good for cats. Why do you use it? EcoEars uses denatured grain alcohol which is a naturally occurring substance and is safe for use on humans and animals. If you’ve ever dealt with swimmer’s ear, you’ll know that alcohol helps dry up the humid environment in the ear that causes pain and helps disinfect the ears. There are many types of denatured alcohol and they are not all created equal. The denatured alcohol we use is derived from grains and is denatured with bitter substance that is not toxic at all but helps prevent cats, who enjoy self-grooming, from licking any residual EcoEars. How do I keep my cat from shaking his head when I put this in his ears? Some people find it helpful to wrap their cat in a thick towel to have better control. You may find treating your cat while holding him in your lap is easiest or prefer to place him on a counter top. Typically it’s easier to manage your cat with his back to you for better control. You may find it helps to prepare a couple of cosmetic cotton pads saturated with EcoEars and introduce the fluid this way. You may also use cotton gauze. Alternatively, you may also find placing a cotton pad into the ear opening after you put EcoEars inside their ears helpful, so that if they shake their head the liquid stays in their ears until you’re done massaging them. Some cat owners also have shared that they prefer to use an eye dropper to put EcoEars into their cat’s ears; however, please ensure you introduce a sufficient about of the solution to treat the whole ear. We hope these tips help. Please let us know if you have any other questions. Does this product get rid of ear mites or just get rid of symptoms. How long before the mites are gone? Thank you for your inquiry. Kitties are commonly affected by ear mites. EcoEars for Cats naturally and safely cleans your cat’s ears and is very effective for eliminating the symptoms caused by ear mites. Every case is different, and in most cases you should be able to see improvement within a few days. However, if you know your cat has mites, it’s important to finish the recommended treatment cycle without interruption. 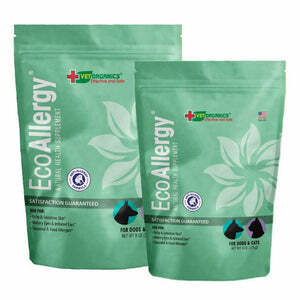 If you have any questions while using EcoEars, please write us at info@www.vet-organics.com. We do guarantee that if it doesn’t work for your cat, we have a 100% money-back guarantee. Will one 4 oz bottle be enough for 3 cats? One of my cats has a severe case of crusties and gunk. One bottle is enough to treat both ears in two cats. If you are going to treat both ears on all three cats you may want to order a 2nd bottle to make sure you are not going to run out, especially if you have one cat with a severe case. My cat will lick this off–Is it safe? EcoEars is made with “denatured” alcohol which has been naturally altered to make it unpalatable to pets so that they are less likely to lick it. It’s okay if they lick a little off. It will not harm him, but we discourage it as it can give him an upset stomach. Does this work also just to clean the ears? My hairless cat’s ears have a lot of wax but no infection. Yes, EcoEars for Cats was formulated to naturally and safely clean your cat’s ears. You may safely use it as a part of well-cat grooming whether or not your cat’s ears are infected. Does this help with a fungus infection (no mites)? Yes, EcoEars for Cats helps with fungal infections, including yeast infections (a type of fungal infection) as well as bacterial infection symptoms and associated irritation. This is true whether your cat’s infection is caused by mites or another trigger. My kitty has ear mites. Will EcoEars for Cats actually kill the mites and eggs? We have posted many of testimonials from customers whose cats had ear mites before using EcoEars for Cats. Also, all Vet Organics products come with a 100% money back guarantee, so if you are not completely satisfied for any reason, just contact us for a refund. Is this safe for kittens? How old should the cat be before using this product on it? We recommend you only use EcoEars on cats 3 months or older.